Where can I find my sales history? 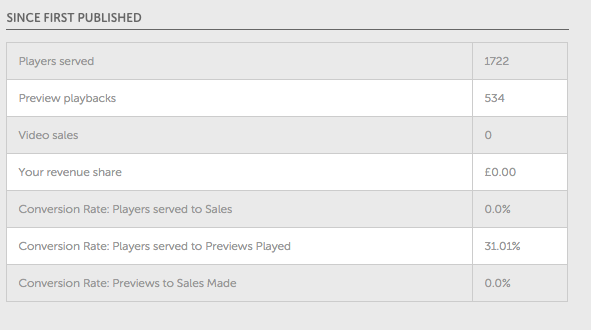 If you click onto the dashboard option, you will be able to see your total sales. You can also see how many sales an individual film has had by clicking on ‘content’ and then selecting a film. This will then give you an overview of sales made for that specific film. The headline figures you see when you first log in are collective statistics for all your videos and provide numbers for sales, players served and previews played for the current month. To dig deeper and find out more about how each individual video is performing click on the CONTENT tab and then select a video to learn more. Once you've selected a video the Video Dashboard will appear, here you'll see how the individual video is perfoming this month, including conversion rates, as well as a table of statics showing stats for the video since it was first published.